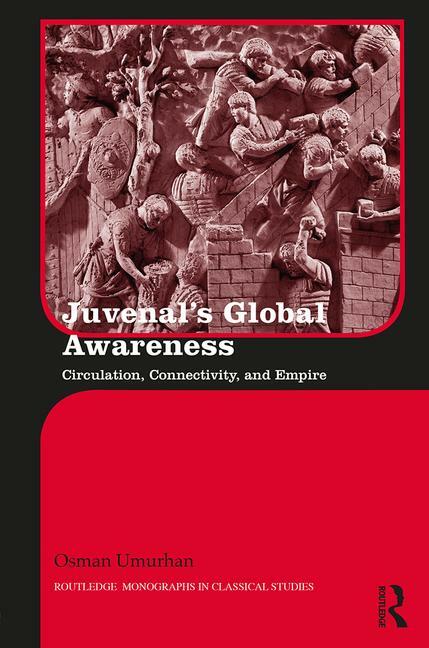 Osman Umurhan, Juvenal's global awareness: circulation, connectivity, and empire, Londres-New York, 2017. In Juvenal's Global Awareness Osman Umurhan applies theories of globalization to an investigation of Juvenal's articulation and understanding of empire, imperialism and identity. Umurhan explains how the increased interconnectivity between different localities, ethnic and political, shapes Juvenal's view of Rome as in constant flux and motion. Theoretical and sociological notions of deterritorialization, time-space compression and the rhizome inform the satirist's language of mobility and his construction of space and place within second century Rome and its empire. The circulation of people, goods and ideas generated by processes of globalization facilitates Juvenal's negotiation of threats and changes to Roman institutions that include a wide array of topics, from representatios of the army and food to discussions of cannibalism and language. Umurhan's analysis stresses that Juvenalian satire itself is a rhizome in both function and form. This study is designed for audiences interested in Juvenal, empire and globalization under Rome.